We, Need Trees... Not The Other Way Round! Sight of a cut tree always makes me extremely angry. I fail to understand man’s ignorance towards many matters that in spite of his knowledge he happily overlooks. I always wondered, from where and since when such anger originated in me and the answer to that, I knew lies somewhere deep within myself. It was discovered a few weeks back while I visited my hometown. Pra and I are childhood friends, apart from being relatives and neighbors. So when he called me personally to invite me for his wedding, I only wished I could be there to meet my old friend but a weekday always seems a little difficult. However chances arranged my travel to my hometown on the next day of his wedding and thus I decided to visit his house which is only a few yards from mine. When childhood friends meet, souvenirs return and we discussed how we played in the fields and hills; we remembered other friends who partnered us in the little crimes. He, his sister, I and my sisters would all gather under the big banyan tree in our house during afternoons. Like the famous five we would get on with our missions. The sisters, re- baked a baked biscuits :-) or they would cook some poha or a new dish and the brothers; we enjoyed a flight with the secondary roots of the lovely banyan trees. The banyan tree! So tall and fat that no three men with their arms stretched and held together could wrap it. The tree, where I have spent so many lonely moments. Holding one of its several hanging roots, pulling myself back, gliding along and once in mid air, jumping to the ground would make me feel like a bird on a clear sky; all the disturbing thoughts lost and worries vented out. I don’t recollect the exact details but when I was still a boy, it was decided to cut the tree. And I watched my favorite tree fall, with its arm like branches falling one after another to the ground until it finally collapsed. 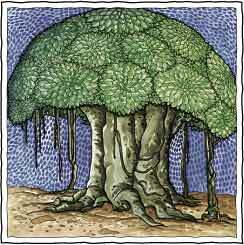 They say a root of a banyan tree runs miles and could uproot a building close to it. That was the unacceptable reason given to me when I could clearly see that the tree was situated safely away from the house. I don’t remember if cried, I really do not have any recollection of images or thoughts from that day but sad, I must have been for sure. Knowing the reason behind your behaviors always helps. Not in avenging but to build ethics and values that you have learnt from the act of good or the wrong doings of others or yourself. So the people who cut trees are doing what they do and they shall continue doing the same. The reason could be simple - Cut the tree that is of no benefit to humans directly and bares no edible fruits, get rid of the one’s that may hinder constructions- houses, buildings or roads. The answer is not in avenging or protesting against them but in believing in your values and planting more saplings that shall grow into trees someday. Let them cut trees and let us, who care for our nature plant more and more.